Sampdoria are one of the form teams in Serie A right now and hope to trip up runaway leaders Juventus again. The Bianconeri needed a late Cristiano Ronaldo equaliser to preserve their unbeaten record in the league, as they drew 2-2 at Atalanta on Boxing Day. A Rodrigo Bentancur red card saw The Old Lady reduced to 10 men in the second-half, but their record signing rose from the bench to help salvage a point late on. Despite a below par performance, the Bianconeri managed to extend their lead over Napoli to nine points after Carlo Ancelotti’s side lost against Inter. With his 12th league goal of the season, Ronaldo became the first player in Serie A history to score in seven consecutive away games in their debut season. Max Allegri will make changes to his starting XI from Wednesday’s encounter in Bergamo. Ronaldo will return to the line-up in place of Douglas Costa to restore Juve’s usual attacking trident. In midfield, Bentancur is suspended and will be replaced by regular starter Miralem Pjanic, who was also on the bench against Atalanta. German pair Emre Can and Sami Khedira accompanied Bentancur in midfield, but one of those will be replaced by the returning Blaise Matuidi after he missed Juve’s last outing with a fever. The back four will likely remain in place, as Allegri is without defensive options Juan Cuadrado, Andrea Barzagli and Joao Cancelo. The Juve boss will field his strongest possible line-up as he looks to end the year in the best manner. Sampdoria are second only to Juve in the form table after collecting 14 points from the last 18 available. With their last defeat coming back in early November, the Blucerchiati have risen to fifth place and sit only two points off Lazio in the final Champions League spot. A 2-0 home win over Chievo in midweek was accompanied by another magical moment from their talisman Fabio Quagliarella, who is currently the Peninsula’s in-form striker. Marco Giampaolo’s squad is close to full strength with only Bartosz Bereszynski and Edgar Barreto missing through injury. Jacopo Sala will continue at right-back in the absence of Bereszynski, while Omar Colley will compete for a starting spot at centre-back with Lorenzo Tonelli after he replaced the Italian in the starting XI for the match against Chievo. Riccardo Saponara started in the trequartista role in that game, however he was replaced by Gaston Ramirez shortly after half-time and scored, so he could play from the start here. Samp are one of the few teams to experience winning in the Juventus Stadium. The side from Genoa recorded a 2-1 victory here in 2013 and in current form Quagliarella and co will make the short trip confident of causing an another upset. If Juventus win, they will break the all-time record of 52 points for the first half of the season, set in 2005-06 and 2013-14. The first half of the season comes to a close with the bottom two Chievo and Frosinone facing off at the Stadio Bentegodi. Frosinone’s new Coach Marco Baroni and Chievo’s Domenico Di Carlo, who is their third tactician of the campaign, are both looking for their first wins of the season. Following the Boxing Day game, Baroni’s Frosinone have two draws out of two, although he might feel somewhat unfortunate not to have registered his first victory against an out of sorts Milan side, thanks in large to Gianluigi Donnarumma’s goalkeeping and a controversial VAR decision which overturned a Camillo Ciano strike. Chievo went into their Boxing Day fixture against Sampdoria following six straight league draws, but a moment of Fabio Quagliarella magic terminated that run. Both sides come into this fixture separated by five points and with very similar goal records, so this is an ideal opportunity for Chievo to put right the record of being the only team in any of Europe’s big five leagues without a win to their name. Chievo will likely return to a 4-3-1-2, as Luca Rossettini is back and sends Bostjan Cesar to the bench. Joel Obi was substituted last time out with a muscular injury and is a doubt for the game. Experience and inspiration will be vital for Chievo in this must win encounter, so club legend and all-time top scorer Sergio Pellissier could be recalled to partner Mariusz Stepinski from the start. Frosinone could recall Daniel Ciofani to the starting line-up to play alongside Camillo Ciano in attack. Lorenzo Ariaudo made way for Bartosz Salamon in the second half against Milan due to injury, but is likely to keep his starting place. Francesco Zampano should return ahead of Paolo Ghiglione at right wing-back. Emil Hallfredsson, Federico Dionisi and Luca Paganini all remain long-term absentees. Chievo have won all five previous meetings with Frosinone between Serie A, B and the Coppa Italia, scoring 13 goals and conceding two. Inter travel to Empoli as they look to continue their three-match unbeaten run in Serie A and shake off a week of controversy. The Nerazzurri officially consolidated third place on the Serie A table with a last-minute 1-0 victory over Napoli on Wednesday night. The win, however, was overshadowed by the racist taunts toward Napoli’s Senegalese centre-back Kalidou Koulibaly throughout the encounter. Nonetheless, Luciano Spalletti and Samir Handanovic praised their side and their ability to win, with the latter claiming that such a victory could potentially give them a huge boost in confidence, not to mention put them back in the running for second. Despite the win, Inter have only been able to find the net no more than once per match in their last five in all competitions, so they will be looking to break that this weekend. Spalletti has hinted that midfielder Radja Nainggolan is back in the squad following his internal suspension for disciplinary issues. He is expected to start, as the 4-2-3-1 formation returns in the absence of suspended Marcelo Brozovic. Meanwhile, Empoli are on a three-game losing run and are in need of a positive result to further strengthen their position in the table. They currently sit 16th, just three points shy of the dreaded relegation zone. They have conceded three goals or more in each of their past three games. They were downed midweek by Torino and were last weekend sunk by a Gianluca Caprari brace in a 4-2 loss to Sampdoria. Rade Krunic and Giovanni Di Lorenzo are suspended, but Miha Zajc returns and Domenico Maietta is not 100 per cent fit. Inter have won nine of their last 10 Serie A meetings with Empoli, drawing the other, since a 1-0 defeat here in April 2006. Both Genoa and Fiorentina must shake off disappointing Boxing Day defeats to pursue their objectives. 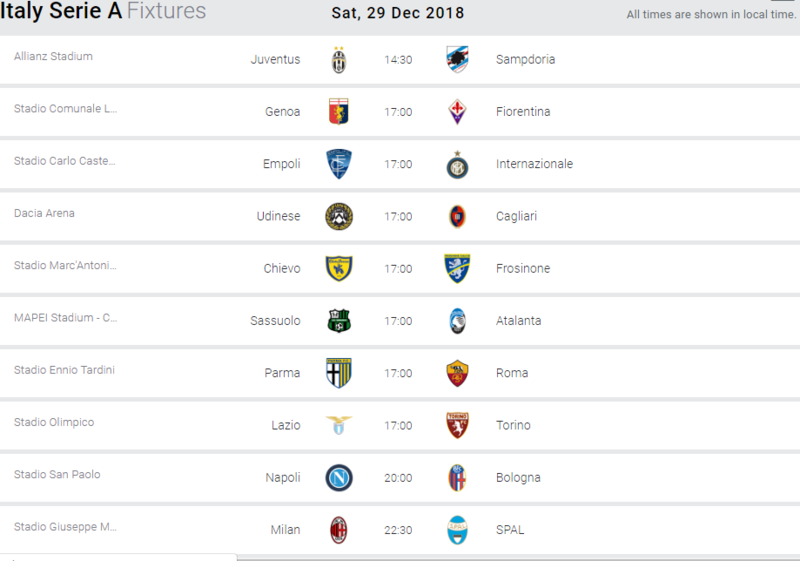 This is the last round of Serie A matches before the winter break and both managers will be looking to finish 2018 with three points. Genoa have won just one of their last 11 league games, but return home to the Stadio Luigi Ferraris, where they have lost only twice this season and just six in this calendar year. As for La Viola, their away form has been slightly odd, winning none of their opening eight league games on the road, but only losing three. They are unbeaten away from Florence in their last five, a run which stretches back to October. They have drawn four of those matches and, in general, are a relatively tough team to beat. They have the same amount of defeats (five) as fourth-placed Lazio, but only have six wins in their 18 league games so far. Given the Rossoblu’s form at home and Fiorentina’s strong away showing in recent months, this game looks like one that could end in a draw. Both sides have scored 25 goals this season, but Genoa’s defensive record is why they are four places below their opponents this weekend, as they have conceded 35 goals, which is worsened by only two other clubs in Italy’s top flight. Their defensive issue needs to be sorted heading into 2019, as they are only six points above the relegation zone, and that goals conceded stat is worthy of a team down at the bottom. Pioli’s team have underperformed so far this season and the draws are holding them back from pushing for a Europa League place, which should be the aim for a club as big as theirs. They have only scored eight away goals so far, and if you remove their three from the game against Sassuolo, you can see where their problems currently lie. The fact midfielder Marco Benassi is Fiorentina’s top scorer with six goals is another indication of where strengthening may be required in the January window. This game has quite an importance in terms of morale, as going into the Winter break with a defeat for Genoa could see them really starting to look over their shoulders, whilst defeat for Fiorentina could see the gap between them and the Europa League-chasing sides open up. It looks even on paper, but both sides will fancy their chances here. Fiorentina’s home defeat to Parma will have stung and they will be out looking to avenge that loss, whilst Genoa will be looking to bounce back as well after their 1-0 defeat at Cagliari. Vitor Hugo and Gerson are suspended for the Viola, so Edimilson Fernandes should step in, while Kevin Mirallas is available again after suffering from flu. Fiorentina have lost just one of their last 17 Serie A games against Genoa, winning eight of them. Ciro Immobile faces his former club in this head-to-head for European ambitions, as Lazio are back in fourth place, but only five points ahead of Torino. The Aquile have won their last two games on the bounce after going through a previous seven-game winless run in all competitions. Their last outing was a 2-0 away win over Bologna which gave the capital side the points in the battle of the Inzaghi brothers. Younger sibling Simone has seen a turnaround in his side’s fortunes which alleviated some of the pressure that had begun to mount on him. A 3-1 win over Cagliari made it four games since they last lost at the Stadio Olimpico. Their only home losses this season to date came against Napoli and Inter. Brazilian midfielder Lucas Leiva made a return from injury in that win over Bologna, but may not be ready to play two matches in such a short space of time. Marco Parolo and Immobile could make a return to the starting lineup after they were rested at the Dall’Ara. Valon Berisha and Riza Durmisi are struggling with injuries. Toro, on the other hand, are in eighth place sitting five points back from their hosts and are definitely in the hunt for a Europa League spot. The Granata are coming off the back of a 3-0 home win over Empoli and have lost only two of the last 13 Serie A games. That resilience makes Walter Mazzarri’s side a tough unit to break down. Mazzarri will have to do without goalkeeper Salvatore Sirigu again after the former PSG man hurt his back in the Derby Della Mole. To make matters worse, understudy Salvador Ichazo is not 100 per cent fit either, so we could see third-choice goalkeeper Antonio Rosati step in for his first Serie A appearance since May 2014. Toro are unbeaten in 11 Serie A away fixtures, winning three, their longest positive streak since 14 in 1977. Roma got back on track with a convincing victory over Sassuolo, but Gervinho’s Parma are fresh from shocking Fiorentina. The Ducali’s win at the Stadio Franchi on Wednesday ended their four-match winless streak. Roberto D’Aversa’s men currently sit in joint ninth place with 25 points alongside La Viola, Sassuolo and Atalanta. The Crociati will be aiming to repeat their spirited Fiorentina display when they host Roma on Saturday, as their compact defending and speed on the break could trouble any team. Roberto Inglese, Jonathan Biabiany and Luca Siligardi started against Fiorentina and looked extremely dangerous when given space on the break, so that is something Roma should be wary of. Gervinho is expected to start against his old club, as the Ivory Coast international was given a few minutes on Wednesday and is getting closer to full fitness. His presence in the starting XI should help Parma exploit the lack of speed in the Roma backline, as both Federico Fazio and Aleksandar Kolarov have been regularly exposed since the start of the season. Khouma Babacar’s goal for Sassuolo in the dying minutes of the game on Wednesday fully showcased that. Luckily for the Giallorossi, the Senegalese forward’s strike didn’t cost them points this time, as Roma completely outplayed the Neroverdi and were sitting pretty on a 3-0 lead at the time. Eusebio Di Francesco called his team’s display against Sassuolo “one of the best, if not the best performance of the season”, as the Giallorossi were fluid in attack, solid in defence and looked balanced throughout the majority of the 90 minutes. Patrik Schick, Diego Perotti and Nicolò Zaniolo were all impressive and this is something the Giallorossi want to build on, not to mention the return of Edin Dzeko. However, bizarre lapses of concentration were still creeping into Roma’s game, as Domenico Berardi surprised Robin Olsen and nearly scored from the centre-circle, while Babacar’s late goal means La Magica’s last clean sheet was in October. The Giallorossi have now conceded at least once in 10 consecutive Serie A games. Despite scoring just 17 goals since the start of the season, Parma will be confident of their chances against Roma. The Ducali will try to contain Di Francesco’s men and use their chances on the break against a side that has rarely looked balanced. On the other hand, Roma will try to dominate possession and put pressure on Parma without risking too much, especially at the start of the game. Parma are without the injured Alberto Grassi, Antonio Di Gaudio, Gianni Munari, Federico Dimarco and Francisco Sierralta. On the other hand Daniele De Rossi and Davide Santon are the only notable absentees for Roma, as the injury crisis in the capital club finally seems to be coming to an end. The last time Parma defeated Roma was in 2012, when strikes by Ishak Belfodil, Marco Parolo and Cristian Zaccardo secured a 3-2 victory for the Ducali. Since then the Giallorossi have won four and drawn one against the Crociati, scoring 11 and conceding just four goals during that stretch. Atalanta will be going into this game with some confidence to grab all three points against a Sassuolo side fresh from a 3-1 defeat at Roma. The Orobici were 12 minutes from doing what no team has done this season and take three points against a 10-man Juventus side. Duvan Zapata thought his brace was enough until substitute Cristiano Ronaldo popped up and headed home his 12th of the season and maintain Juve’s unbeaten record. Gian Piero Gasperini will still feel his men should’ve got the win, but can still be content with being only the second Serie A side to take points off the leaders this season. Meanwhile, Sassuolo are winless in two games and were carved apart by a dominant Roma side, including a sensational debut goal by Nicolò Zaniolo. Roberto de Zerbi should be making a few changes, as Rogerio returns from suspension, but Kevin Prince-Boateng, Claud Adjapong and Jeremie Boga are still injured. Jose Luis Palomino and Rafael Toloi are back after their bans, although Marten De Roon remains sidelined with an ankle injury. Both sides currently sit mid-table on 25 points and hoping a win will move them closer to the Europa League spots. Sassuolo haven’t beaten Atalanta in their last eight Serie A meetings, drawing four and losing four. Cagliari will fancy their chances of causing a real upset at the Dacia Arena, as Udinese are missing key man Rodrigo De Paul. This is a relegation battle between two sides who expected to do better this season, but are hovering above the drop zone. The Friulani are in the worst position, sitting only two points clear of the bottom three, whereas the Sardinians have moved closer to mid-table thanks to their victory over Genoa. Davide Nicola’s arrival had boosted Udinese’s prospects with an opening victory over Roma, but that was followed by just three stalemates in five rounds. The big loss here is Rodrigo De Paul, who has contributed six goals and three assists this season, playing a part in nine of the team’s total 14 goals. He is suspended, joining injured Samir, Lukas Teodorczyk, Emmanuel Badu and Svante Ingelsson in the stands. Kevin Lasagna is expected to partner Ignacio Pussetto, but Valon Behrami and Rolando Mandragora simply don’t provide anywhere near the creativity or pace of De Paul. Cagliari are back on track after their narrow victory over Genoa, having given Torino, Roma and Napoli a real run for their money in recent weeks. They have climbed to mid-table, albeit still only five points clear of Udinese, as that win ended a run of four draws and three defeats. Like De Paul, losing Joao Pedro is a big problem for Cagliari, as he is not 100 per cent fit and looks set to miss out. Ragnar Klavan is also on the treatment table with long-term absentees Lucas Castro and Charalampos Lykogiannis. Nicolò Barella instead takes more of a trequartista role behind Leonardo Pavoletti and either Diego Farias or Alberto Cerri. Cagliari have won only two of their last 23 Serie A visits to Udinese, drawing seven. Napoli will look to bounce back from their controversial last-gasp defeat to Inter and host a desperate Bologna. Carlo Ancelotti’s side will try to start a new winning run against Bologna a few days after their 10-round unbeaten streak was ended by Lautaro Martinez’s late strike. The game on Saturday will lack the presence of Kalidou Koulibaly and Lorenzo Insigne, as both were shown red cards during the dramatic game against Inter. The tough Boxing Day match also saw Marek Hamsik pull up with a muscular injury that forced him to leave the field after 23 minutes. He’ll miss the Bologna game and join the injury list alongside Romanian player Vlad Chiriches. In theory, this is the ideal fixture for Napoli to get back on track, seeing as Bologna are without a victory since September and Coach Pippo Inzaghi is hanging by a thread. The club seems to be backing their tactician in the hope that a massive January transfer window can revamp the squad. Diego Falcinelli and ex-Napoli midfielder Blerim Dzemaili are in doubt for this match, but Rodrigo Palacio was rested so he can start. After all, La Trenza has scored in two of his last three Serie A visits to the Stadio San Paolo, playing for Inter and Bologna. Bologna have lost each of their last five Serie A encounters with Napoli. Gennaro Gattuso’s Milan host SPAL knowing full well anything less than a crushing, convincing victory will see him sacked. The Rossoneri are without a win in five, including a defeat to Fiorentina and draw with Frosinone in penultimate place, whilst SPAL have now experienced nine winless games in a row. Milan have dropped in one fell swoop from fourth to sixth, opening up the door to a Gattuso dismissal. It won’t be enough just to beat SPAL, as the performance must be a dominant one from a side that has failed to score in four Serie A rounds for the first time since 1984. Franck Kessie and Tiemoue Bakayoko returned from suspension against Frosinone, but were still unable to change their fortunes. Under-fire boss Gattuso is experiencing an injury crisis at present, and Milan are struggling for depth. Ivan Strinic, Mattia Caldara, Lucas Biglia, Giacomo Bonaventura, Fabio Borini, Andrea Bertolacci and Suso all missed the Frosinone game through injury and will likely remain unavailable. Jasmin Kurtic is expected to return to the SPAL line-up now that he has served his suspension after picking up his fifth red card of the season away to Napoli. The massive loss for Leonardo Semplici is star man Manuel Lazzari, the pacey winger who is struggling with a sprained ankle. A win for the home side would take the pressure off Gattuso at least until they face Sampdoria in the Coppa Italia and Juventus in the Italian Super Cup, but the pressure is on now more than ever. SPAL have not beaten Milan in Serie A since June 1957, followed by seven draws and 15 defeats.